In the letterpress market you will find products with varying depths of printing impression. On one end of the spectrum is the traditionally-favored “kiss impression,” in which the printer applied just enough pressure to the type or printing plate to give adequate ink coverage on the paper, but the resulting print is devoid of any visual or tactile paper indentation on either side. Conversely noted are the letterpress prints that exhibit bitten, punched, or heavily debossed impression. These prints exhibit a depression where the type or plate came in contact with the paper, and usually a noticeable raised surface on the sheets’ verso or reverse side. Impression depth today is an aesthetic choice made by the printer and client, however it is one that might have some lasting effects on the printer’s supply of vintage type. The purpose of this article is to offer some historical background and guidelines for making decisions regarding impression depth. Look at any number of historic printers’ manuals and you will notice a wealth of information about selecting type and paper, locking up forms, and even proof correction and orthography. There is a surprising dearth of information about what the optimal impression should have been to our printer forebears. One explanation for this gap in the literature is perhaps that the appropriate amount of impression to apply in letterpress printing was tacitly taught in the press room—master to apprentice. It was just something one had to see and feel. 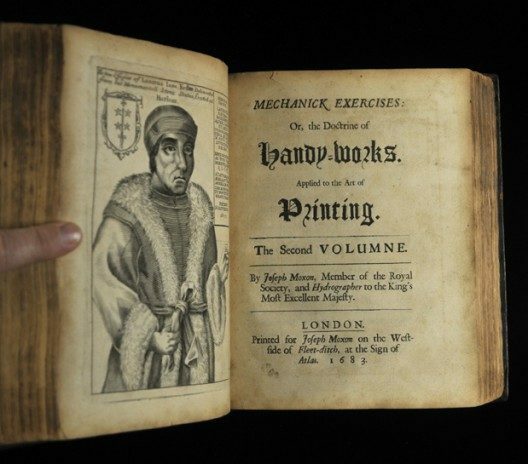 Joseph Moxon, Mechanick Excercises or the Doctrine of Handy Works, London, 1683. Printing on a wooden hand press pre-1800s was a somewhat different craft than what developed from the industrial revolution era and after. The linen and cotton rag paper of the first three centuries of Western printing was more forgiving in showing any bite. These hand-made papers were sometimes mottled in caliper and cockled. To achieve an even impression printers would often dampen the sheets, which in turn minimized impression on the verso. Wood-pulp paper for commercial use is a fairly recent development, dating from the 1800s. The Fourdrinier papermaking machine received its first patent in 1801 in England. 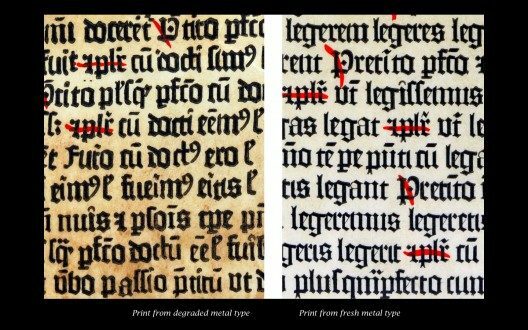 Paper coatings like starch were introduced in ancient times to improve the surface characteristics and light reflectance of paper, but the automation of paper manufacture made coatings easier to apply on a large scale. They added gloss, improved ink hold out, and whitened the sheet. For letterpress printing though, coatings on thinner machine-made wood pulp paper were meant to make the type “pop” and halftones/line engravings sharp with simply a kiss impression and no dampening. (Remember faster steam-driven presses and softer alloys in machine-cast metal type, also promoted the “kiss” aesthetic: print faster, less impression to minimize typeface wear.) Any visible debossing on the verso of these “perfect” sheets was not tolerated as show-through because it affected the words’ readability. Jacobus de Voragine, The Golden Legend of Master William Caxton Done Anew. Hammersmith: Kelmscott Press, 1892. However, in the contemporary letterpress marketplace, the depth of impression doesn’t need to define what kind of printer you are. As printing moved from being simply the workaday medium of communication in books, newspapers, and magazines that were duplex printed on thin, sometimes hard, sometimes coated papers, an aesthetic change in acceptable depth of impression was warranted. Clifford Burke called this new aesthetic “Typographic Printmaking,” and we’ve advanced this deeper impression into 21st century. 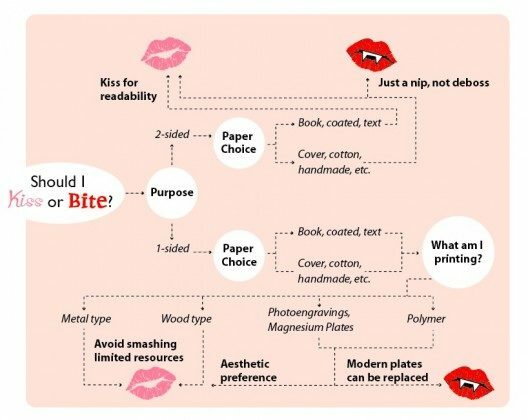 When making design decisions about kiss or bite impression, it all comes down to whether or not you are printing one or 2-sided, what kind of paper you are using, and what kind of plates or type you are printing with. There are some major variables that will encourage you to make the responsible decision to kiss rather than bite, no matter what paper is used. Most importantly: safeguarding your antique or vintage type. Schema from Kiss vs. Bite lecture given by Amelia Hugill-Fontanel at the 2013 Hamilton Wood Type Museum Wayzgoose. Because what actually happens when you smash lead type over time with a heavy debossed bite impression is loss of sharpness, thickening of the counters, more haloing around the edges of the print, and general degradation of readability. And most times, you cannot recast that vintage type. E. Duverger, Histoire de l’Invention de l’Imprimerie par les Monuments, Paris, 1840. So, safeguard that metal type, and kiss it. And kiss the wood type too, which as a function of being old, potentially warped, and dried out, can crack or delaminate under heavy impression. Drudgery associated with composition of metal type is eliminated on the personal computer, like the minutiae of hand-justifying. Perfectly level resilient printing plane, eliminating some makeready. Good-bye excessive underlays! Good coverage in solids & reverses. High wear characteristics because polymer is resistant to abrasion. This equals longer press runs. Print without fear of damaging plate surface on handmade paper that has fibrous inclusions or is rough. We are witnessing this letterpress renaissance now as a result of our 500-year-old craft’s merger with digital technology. 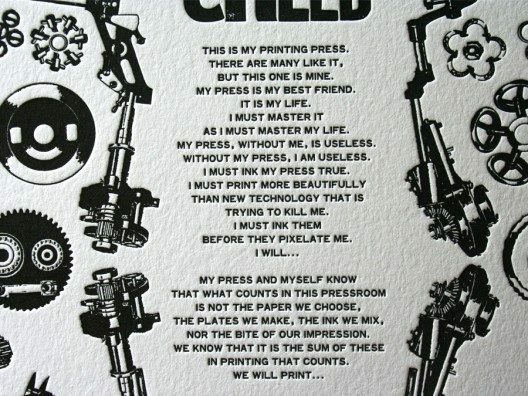 Excerpt from the 2010 broadside, “Pressroom Creed,” by Studio on Fire. Printers, think twice about the depth of impression you are exerting on your type. Is your type rare or irreplaceable? If so, check your packing, measure the caliper of your paper, and don’t settle into the bite for bite’s sake hoopla. When a heavy deboss is called for, err on the side of caution, use that new-fangled technology to your advantage and have a plate made instead. Practice safe impression!